Stepping out to curbside with suitcases, car seat, toddler and travel crib in tow, I was already overwhelmed. Disney was still a few hours away and we had to get through the busiest airport in the world, Atlanta Hartsfield, down to Orlando and over to the Kingdom. Our young daughter could barely contain her excitement to see “The Castle!” and wanted to get there as soon as possible. I’ve flown on long overnight legs with no room to stretch; commuter flights with aisles so narrow there were no armrests and plenty of crowded, overbooked flights. But I’ve never experienced anything as seamless as getting down to Disney. It all started with our luggage disappearing at curbside and it magically arriving in our room in Orlando without ever touching it again. We booked the free MagicalExpress service in advance, and roughly two weeks before departure, Disney resort luggage tags arrived at our front door. We attached it to our luggage, checked-in our bags and everything magically arrived in our Disney resort hotel room up to three hours after your arrival. Key for generational vacation goers, Magical Express allows you to just meet-up with your party at the resort or park without coordinating baggage claim issues and transportation. It’s also ideal if you have less than mobile relatives or grandparents who need to focus on getting around instead of where their luggage is. The checkout process proved just as easy. Disney Resort hotels have a complimentary airline check-in desk where they can print boarding passes, check your luggage and have it all arrive at your final destination. Too bad your luggage can’t magically arrive inside your home. I expected to deal with park tickets and cameras, but was pleasantly surprised by what’s changed since I was last at Disney (a lot). I hate to admit I haven’t been to Orlando in nearly two decades, so wasn’t familiar with their MagicBands system. My daughter was delighted by her colorful wristband that just needed to be pressed against our hotel room lock to open. She loved sorting out our bands and knew which color belonged to whom. We hooked up our park admission to the bands, making it easy to buzz through. We also opted to have our resort’s concierge hook-up a credit card to the band and picked a pin number for it. This meant no worrying over wallets, cash and cards. We just used our bands at the park for lunch and souvenirs. MagicBands are complimentary for annual pass holders and those staying at the resort. Otherwise, you can purchase one at one of Disney’s theme parks or Downtown Disney for $12. Bands are yours to keep and make a fun souvenir. My daughter proudly showed hers off at preschool when we returned. Unlike my Dad (Pappy to my daughter), I’m not a shutterbug and would rather enjoy the day then get behind the lens. The PhotoPass package worked great for us and we also hooked up the service to our MagicBands. Stop to have your photo taken by one of Disney properties many professional photographers at various points around the parks. They scan your band after your photos are taken and everything goes into you account for easy download. If you’re on the fence, ask one of the photographers for a PhotoPass card. There’s no charge for the card, or to have your photo taken, but you’ll have to register online to view and order photos for a fee. PhotoPass is available for $69.96 if you purchase at least 2 weeks in advance. Otherwise, it’s $99 when you arrive. The package comes with unlimited PhotoPass photos in your online account, customization options and opportunity to buy prints online. 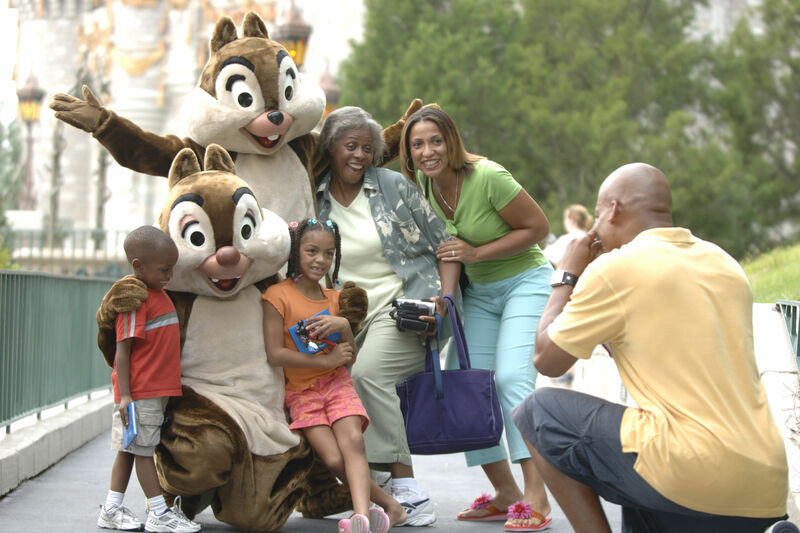 Key for family reunions, grandparent travel and generational vacations, PhotoPass can take photos without it becoming one giant selfie or Mom always being absent while she snaps photos. Disney’s photographers can also scan multiple people’s cards or bands so the whole family can go online and view or download. We barely had to remember anything except our MagicBands and enough snacks and water for the day. (Somehow we never remembered umbrellas despite it calling for daily rain, which so far cannot be remedied with Disney magic). We stayed on the Epcot side at the Atlantic City, turn-of-the-century-style Boardwalk Inn with easy access down to the Boardwalk with restaurants like ESPN Zone, a boat to Epcot and Hollywood studios. I loved being so close we could even walk to Epcot and see the fireworks, but it’s key to pick a resort where you’ll spend the most of your time. If you’re on a generational trip and grandma and grandpa struggle a bit to get around, choose a park with quick transportation to whichever park you’re going to frequent the most so family members with variying needs can get back and forth quickly. Families with young children should consider staying on the Magic Kingdom side to zip over on the monorail for a day on the rides. We opted to take the free shuttle bus from our hotel to Magic Kingdom, though walking to Epcot and then hopping on the monorail was also an option. If you have a park hopper pass, stay on the Epcot side and enjoy a quiet breakfast with the grandparents before heading to the Magic Kingdom or Hollywood Studios. 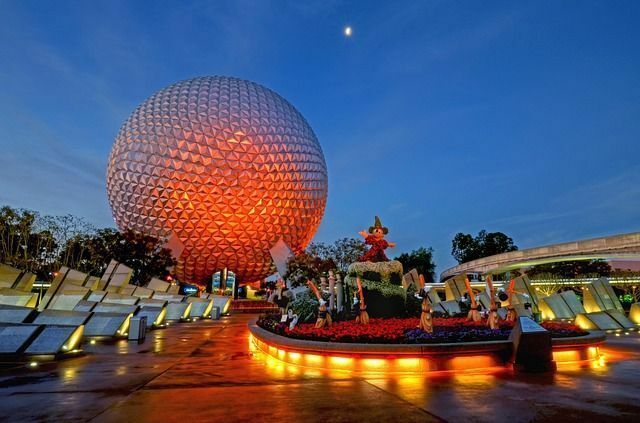 Epcot is typically less chaotic than the Magic Kingdom and there are fewer lines for rides like Three Caballeros in Mexico at the World Pavilion. My daughter loved the rides and wanted to get on something as quickly as possible. Once the kids have ridden a few things at Epcot like Finding Nemo, head over to the Kingdom for a snack and start exploring. 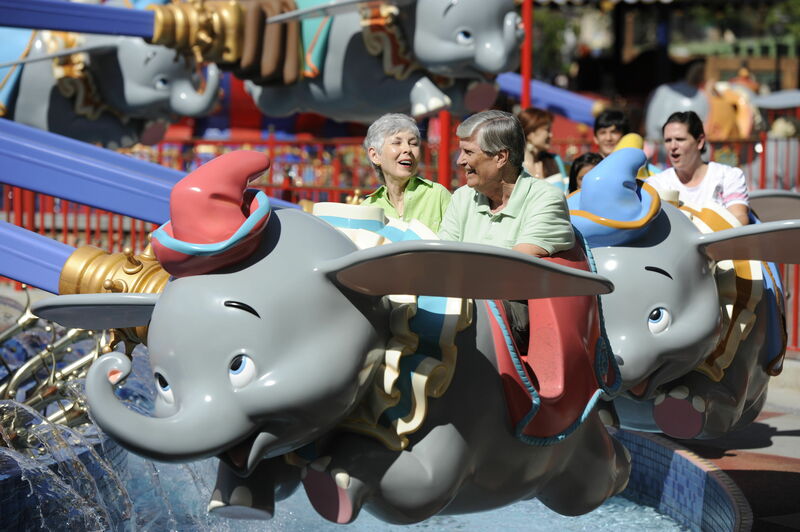 Grandparents can choose to stroll through Epcot and meet up later, or embrace themselves for an onslaught of Princess meet-and-greets, a splash through the Pirates of the Caribbean and checkout Tomorrow Land. Luckily the free old-fashioned train at Disney takes a spin around the park and makes stops at Frontierland, Fantasyland and Main Street. It makes for convenient transportation, and also a relaxing 20-minute ride if you want to escape the crowds for a few minutes. If you’re on a budget and want to get the very best value for your money while still staying on resort, go the week after Labor Day or the first week of December. Not only are the lines less during these weeks, but costs are cheaper. If I had to encourage you to pick one, go during early Fall for the best Disney deals. Waits for rides for grandparents and kids can be long (not to mention Mom and Dad), so download the My Disney Experience app and schedule yourself for limited Disney FastPass options. Check the wait times on the app first before scheduling.There’s no point in using FastPass for a ride like It’s a Small World with lines shorter than 10 minutes. In our experience, lining up to meet Frozen Princesses Anna and Elsa followed by Cinderella (“Unabuna” as my daughter calls her) and Rapunzel was going to take 80 minutes per Princess duo. This is when FastPass is crucial and means the difference between missing a ride or experience altogether or waiting a mere 5 minutes. FastPass is free, but it’s essential to book your experience in advance. Guests get three options per day at one theme park with one additional option (after you used up all 3) based on availability. You can change your FastPass requests on the go, but be aware it’s not always possible to get all three that you want in one day. For example, if you pick a character greeting with Elsa and Anna, your app will show you that option along with two others. You’ll typically have four scenarios to choose from. But you might end up with Elsa and Anna, Dumbo and Splash Mountain even if the latter wasn’t on the top of your list. My daughter hasn’t been much of a napper since she edged near 2-years-old (much to my dismay), and was never ready to leave the park. But she still desperately needed quiet time to unwind. Whether you’re a parent, kid or grandparent trying to have fun on the Flying Dumbo ride or just got off the Mine Train, a noonday stop is essential. Use a break to your advantage to do some family bonding over some ice-cold drinks or Mickey ear ice crea. Or just give each other some space while kids go meet Mickey and Tinkerbell while grandparents shop on Main Street. We used the Disney Railroad as a way to get our daughter to sit and relax for nearly a half an hour while still being entertained by the stops. For a quiet escape, take a raft from Adventureland to Tom Sawyer Island for shade and rocking chairs while the kids explore. The area around Liberty Square is also full of nooks and crannies with benches, and tends to have fewer crowds than the cluster around the castle. Of course, if a nearby show, parade or fireworks start, then your quiet slumber is going to turn into a party. Epcot has lots of opportunities for quiet spots. Just wander through the World Pavilion. At Epcot, try the United Kingdom courtyard for a garden-side rest with cobblestone walkways. There’s also a quiet garden at the China showcase with a Temple of Heaven replica. If you want a close hop from the Kingdom without going back to a resort that’s on too far away to make it worthwhile, take a boat from the Magic Kingdom to the Wilderness Lodge at Fort Wilderness. Though I loved the Boardwalk Inn and highly recommend it, I would opt to stay in Fort Wilderness Resort on our next trip. This wooded forest wasn’t on my radar at all, and you would never even know you were even at Disney when taking a hike on one of the well-marked trails. Guests can stay in the Wilderness Lodge complete with all the modern amenities and cool AC, park an RV, pitch a tent or rent a cabin. The grounds offer horseback riding, nightly Disney movies, roasting marshmallow opportunities and wagon rides. Fort Wilderness’ General Manager, Jose Mola, shared that many people come to Fort Wilderness on vacation without heading to the theme parks. Instead they opt to set-up their RV, stay in a cabin or in luxury at the Lodge and take advantage of all the activities on the property. I believe it. The resort has pools, archery, animal encounters at the ranch, holiday sleigh rides, pony rides, boat rentals… it’s a pretty expansive list and we haven’t even touched on the arcade. What struck me is how tranquil and relaxing it was for being just a boat ride (or shuttle bus) away from Disney’s theme parks, not to mention the rest of Orlando. It’s definitely worth looking into if you’re on a trip with the grandparents or kids who need to unwind after endless theme park stimulation. There are still plenty of things to do together as a family after watching grandma and grandpa scream their heads off on Space Mountain. My family ate dinner at the campsites and had the pleasure of celebrating the campsite’s Hoop-Dee-Doo Musical Revue‘s 40th anniversary. The supremely talented Pioneer Players put on an entertaining interactive show with singing, jokes and more jokes. Normally I find this type of entertainment to be a bit too corny for my tastes with lots of puns in the mix, but it was so well executed and fun I didn’t want it to end. Our waitress was proud to share she’d been working at the restaurant for just over 40 years and completely loved it. Her enthusiasm showed as she took the stage before coming down the steps to serve up buckets of fried chicken, ribs and sides. Kids got to take part in the show while a grandfather even (willingly) donned a tutu and did a little dance on stage. I admit before the trip, I was thinking of Disney being more like Six Flags on steroids. But Disney is so well executed in everything they do; I nearly forgot it was a theme park at all. I never saw a scrap of garbage lying around our entire visit, and there is something to be said about that Disney magic bubble you enter. Everyone is helpful and the ride cast members were surprisingly cheerful for saying things like, “Step forward and in a boat” hundreds of times a day. Staying on the resort also made all the difference in terms of ease and maximizing time and eliminating stress. Many families have dual working parents and grandparents out of state. There also might be aunts, uncles, cousins, and stepsiblings coming together for one experience. Disney works to help eliminate the family chaos by making things simpler. And your version of that can vary greatly. But other people might want an escape within an escape. That could mean pitching a tent in the woods at the Fort Wilderness Resort for $49 on up so you can get back to nature after standing in lines all day at Adventureland. Or choosing from one of Disney’s moderately priced resorts. The Pappy in our family’s version would certainly be having PhotoPass to get some posed shots of the family with a Disney photographer. Of course he would still have plenty of opportunity to take his own candid shots. My Mom’s would be an air-conditioned ride right to the resort from room with lots of restaurant options like the Boardwalk. My version of “easy” was never needing a wallet, camera, transportation worries and the ability to do a little laundry and make a special meal in my suite at the Boardwalk Inn. It also helped that every Disney “cast member” from hotel reception to bus driver to dining cashiers have endless stickers on hand. That’s my daughter’s version of simple happiness.